Burj Al-Luqluq Social Center Society opened the Youth Wall which represents the reality and hopes of the youth, on Tuesday 07/11/2017 at Al-Makased Hospital. 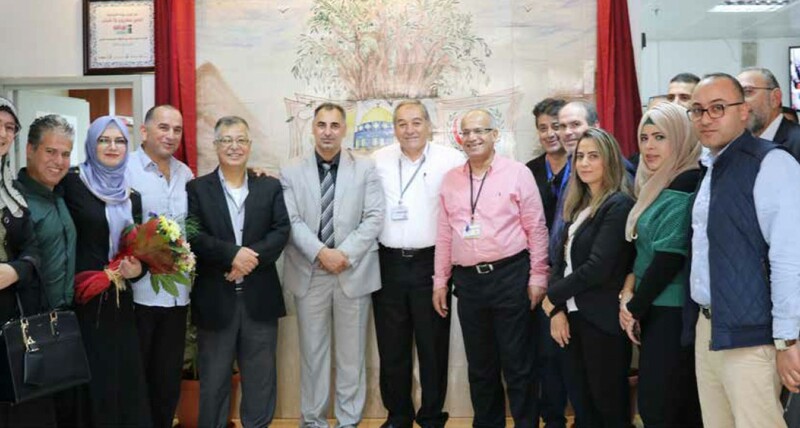 The opening took place in the presence of Hamdi Rajabi from the Ministry of Jerusalem Affairs, Dr. Bassam Abu Libdeh, the Head of AL-Makased Hospital, Naser Gaith, Burj Al-Luqluq Head of Board Members, Muntaser Edkaidek, Burj Al-Luqluq Executive Manager, in addition to the Mayor of Mount of Olives, Ahmad Abu Ghannam, Ola Belbeisi who prepared the Wall, alongside with the ceramic students and their teacher Adham Hamayel. Ola Bilbeisi, the creator of this Wall, stated that “this work gave her the opportunity to transfer the details of the Holy City of Jerusalem including the historical and religious places and link it to the health sector, as the wall was put together at Al-Makased Hospital. The Wall was done under the supervision of Burj Al-Luqluq Ceramic Lab within Yalla Shabab project executed by Burj AL-Luqluq and Pal-Vision with the support of UNFPA. It is worth mentioning that the Ceramic Lab was executed by Burj Al-Luqluq and CISP and funded by the EU.